Experience premier "in-between" casino entertainment, that is, in between every kick-off and gasp-inducing fixture, you have a special world of fun tailored to put off boredom just a few taps or clicks away. Enjoy the convenience of having an online casino in your pocket at all times, ready to make your wait or off-time (wherever it may be) a little more bearable, with a colourful, mobile-friendly array of online casino games ready to go when you are. Ghana's best online casino invites you to never feel boredom again, with premier online gambling more accessible and easy-to-play than ever before. Now your sports betting and casino fun are in the same place. 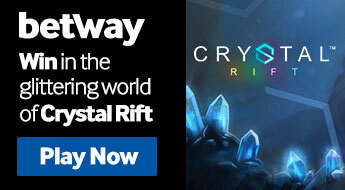 Register now and start your online casino adventure with Betway. Enjoy online slots at your own pace at the Betway Casino. Scroll through a range of different popular game names and get playing. You can rest assured that our slot games are perfectly and specifically optimised for enjoying on your mobile device when you're on-the-go, as well as on your desktop computer if that's your preferred place to play. Try our casino games for free or play with real cash. As far as table games go, online roulette has to be the most enthralling and has proven to be far and away the Ghanaian favourite at the Betway Online Casino. European Roulette, the more classic version of the intense table game, is the most popular perhaps for its many multiple ways to bet. Bet across red, black and the numbers of your choice, perhaps even in combination, or exclusively either, or in groups like even or odd numbers, or simply red or black. Your roulette bet can be as complicated and stretched out across the table as you wish, or it can be as simple and straightforward as you like. This is the closest you'll get to traditional roulette at the casino. 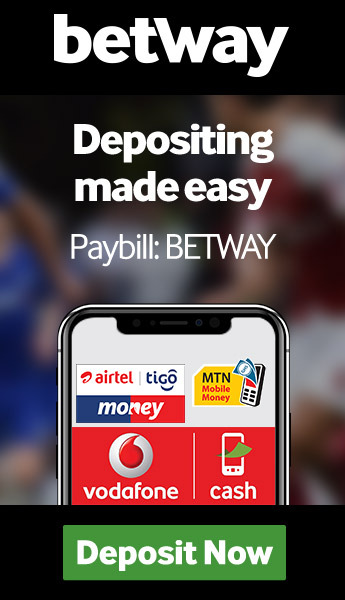 The Betway app is a great way to play anytime, anywhere.Click here to download the Betway app on your mobile device. Spin and Win Roulette takes the roulette game concept and distills the game into a much simpler format. You still have the choice of red and black (this time assigned specifically to a number), but while European Roulette's numbers go up to 36, Spin and Win Roulette has cut this down to 12. The gameplay is simple: wager as much as you like on each individual number and see where it lands; fingers crossed it's landed on your lucky numbers. The best thing about Betway Online Casino is that it never closes. It's always open for however long you need it to be and it's within arm's reach at all times. This is because you have a casino on your phone, and, within a few taps you can be playing on our mobile casino enjoying specially-optimised mobile casino games. The very best in mobile gambling is now at your fingertips, so get in the game. You'll never be waiting for a turn at the table with Betway Online Casino. In fact, it's always your turn and you have a seat waiting for you wherever you are. Join us anytime to get into online roulette or blackjack, with some fun and unique online table games lined up for you to try. Have a crack at online blackjack and you'll be chanting number 21. For simple, traditional blackjack get into Classic Blackjack Gold Series, while Vegas Strip Blackjack offers a more thrilling twist on the original game. On the surface video poker may seem very simple (it certainly doesn't have the depth of complexity of normal poker), but you'll soon see how absorbing it can be. It's almost a new game entirely separate of poker, based on the winning hands of the title game but with randomly generated hands every time you play. If you win, you'll then have the chance to double your winnings over and over again by correctly picking the right turned-over card in a series of challenges.